TMJ stands for temporo-mandibular joint which is your jaw joint. The temporo-mandibular joint is formed by the mandible or jaw bone, joining with the temporal bone of the skull, just below and in front of the ear. You would have one temporo-mandibular joint on each side of your face. Each joint has a cartilage disc inside keeping the temporal bones and the mandible bone apart from each other to protect them from creating wearing of the bone surfaces as well as to act as shock absorber for the joint. 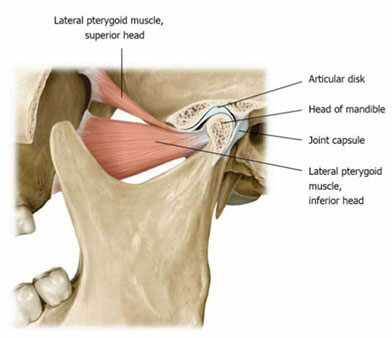 The jaw joint is surrounded by a capsule or envelope enclosing it. The jaw movement is driven by many muscles responsible for its different actions. The TMJ is opened and closed many 1000’s of times each day as we eat, speak, breathe and yawn and is thus the focal point of much activity and physical forces. Disorders of the TMJ are often referred to as TMD or Temporo-mandibular disorder or TMJ dysfunction.